Sheffield-based subcontract engineering business, X-Cel AMP, has invested in an advanced manufacturing cell – engineered by Cyber-Weld – to boost capacity, improve quality and help it keep costs down. X-Cel produces high precision machined components to its customers designs and has developed specialist skills machining metallic sealing rings for the offshore oil industry. The seals are critical components and need to be machined to within 20µ concentricity with a good surface finish being essential. Andrew Taylor, chair, explains, "We've been producing these seals now for 7 to 8 years and before the new cell we produced them on three vertical lathes with one operator on each machine; the operator was also responsible for measuring the machined ring on a CMM machine. The raw material, a formed ring, weighs in at 90kg and 45kg when finish machined, so its pretty heavy to handle consistently over an 8h shift; mishandling does happen with the innevitable damaged ring or tooling. Machined from hard nickel material means that one hard tap on the sealing face makes it a scrap job. "The investment is strategic for several reasons: Firstly I'm aware this product could be offshored so cost down is essential; accidents happen so putting consistent accuracy into the handling process reduces scrap; there is also a real health and safety issue when handling 90kg components. As we're looking at forecast growth in Offshore of 20% year-on-year these issues needed attention." 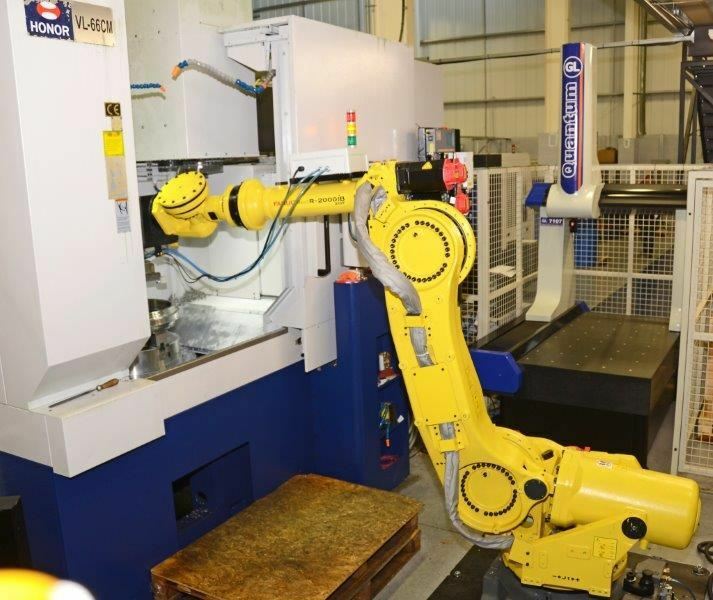 System integration and cell safety control was carried out by Cyber-Weld, a strategic partner of FANUC UK. Core components comprise a FANUC R-2000iB, 210Kg payload six axes robot, a vertical lathe, a laser etching head and a CMM. Cell control is managed by the FANUC R-30iB robot controller which was programmed to provide straight-forward operator intervention of the process if required. The robot picks up un-machined components on the internal diameter using a self centering three jaw gripper. Components are placed into the lathe and machined then removed by the robot and held in position under the laser etching station where certification serial numbers are applied. The machined seal is then placed onto the CMM table and measurement commences. While measurement takes place the robot then loads another un-machined component into the lathe and returns to collect the measured seal. The seal is then placed onto a simple turnover fixture that allows the robot to grip the seal from the other side and replace it onto the CMM to complete measurement. When measurement is complete the robot places the seal in a finished component rack. Stacking units for raw and finished components are designed to allow for at least a full shift of operation without any human intervention - the machining cycle for each component being 20 minutes. "The robot has been faultless – absolutely no problems," comments Andrew Taylor, chair of X-Cel Group. 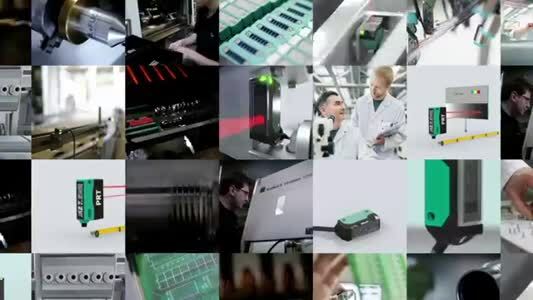 "Of course no matter what time of day it is, the robot performs exactly the same, so no dropped components, no damaged tooling or variable cycle times – exactly what was required. 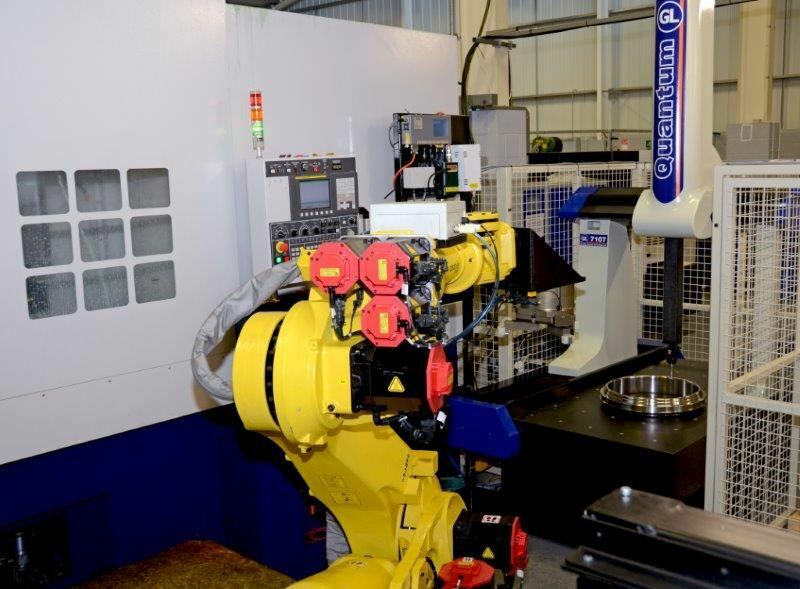 This project was X-Cel’s first experience with a robotic machining cell so we wanted to work with a single source who would manage the machine tool, robot, guarding, CMM and all the interfacing. Cyber-Weld managed this in a helpful and professional manner and we are delighted with the finished cell which is producing excellent quality components. "Capacity has increased significantly. Not only is the new cell throughput higher but we have released three machines and three setter operators to carry out more complex short run jobs. The bottom line is that by being proactive we have kept this manufacturing job here, in the UK, instead of seeing it go abroad."